The above image is the original Rage Comic. First posted to the 4Chan imageboard /b/ in 2008, the comic was quickly reposted and edited by other users to tell different stories. The formula is as simple as the “born under power lines and without hands” art style: the first three panels tell of a situation that leads to a mild annoyance and the fourth panel show’s Rageguy’s reaction, with or without some slight variation. While Internet memes are a dime a dozen, the thing that sets Rage Comics apart are their enduring popularity and the many, many variations that followed. Every new character has helped to sustain the original comic’s basic mechanics and structure while putting a new twist on the joke. 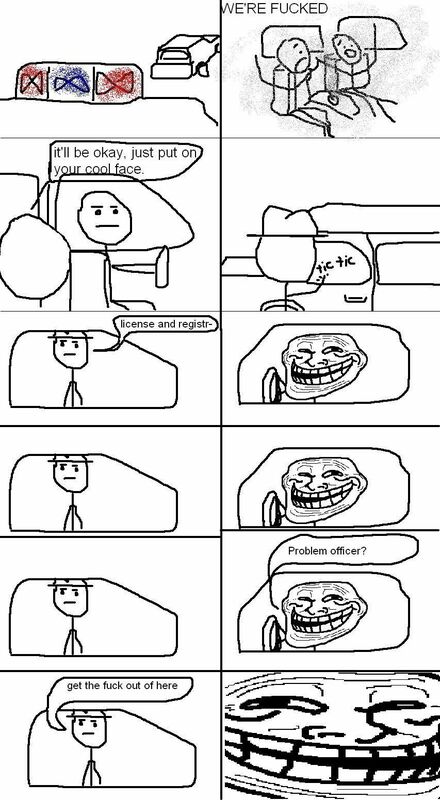 Trollface was one of the earliest Rage Comic spinoffs, first started showing up around 4chan in September of 2008. As the name implies, Trollface is a simple depiction of the average Internet troll, complete with a toothy grin and a smug sense of self-satisfaction. If seeing this face makes you want to break something, then that means they’ve already won. Coolguy is the same character image, used in a different context. Use of Coolguy first appeared on the ebaum’s world forum (the original comic can be seen here, probably grabbed from 4chan). The comics follow a formula similar to the original Rage Guy and first surfaced in 2009. Some things were never meant to escape the two-dimensional plane. Outside of the comics, Forever Alone Guy has also taken a role as an Advice Animal, often explaining how even the smallest details of his life only further remind him of his isolation. The hallmark of Rage Comics is the overreaction featured in the final panel. The character is related to Forever Alone Guy somewhat in that their troubles seem relatively minor. But whereas Forever Alone Guy sees this as some sort of cruel fate he’s damned to endure, Okay Guy simply accepts things for what they are with a twinge of sadness. Feel free to debate amongst yourselves which of the two is more depressing. At first it seems like a non-joke; debuting in 2010 and well after numerous other characters following the same comic formula, Poker Face’s blank expression could have easily been a shot at the redundant nature of the meme’s new spinoffs. Regardless, the charm of his non-face lead to the meme’s spread to numerous forums. In these comics the response of “Me Gusta” (translating, essentially, to “I like it” in English) is usually given in response to disgusting, awkward or perverse situations. His expression only helps to make you feel completely filthy. Yeah, we had to Wiki the name, too. Tyson’s seemingly defensive stance is used in response to ridiculous claims of boasts made by other posters, usually accompanied by some variation of the phrase “Watch out guys, we’ve got a badass over here.” It doesn’t follow the four panel structure of other comics and is instead used in response to photographs and image captures. Many instances of Now Kiss follow Watson/Stone example, expressing the desire to see two people kiss.